It's called Recochoku (レコチョク). That's short for "Record-Chokusetsu" or "Record Direct". And it looks to be Nintendo's take on iTunes. As Kotaku commenters have pointed out, this is an existing music service in Japan. Nintendo is bringing it to its handheld. 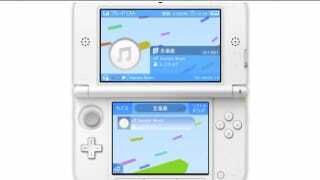 The service begins on the 3DS this December in Japan, and there will be over a million songs available for purchase. You can purchase songs via the 3DS, but you must be a member of the Club Recochoku music service to purchase songs for Recochoku. It seems to essentially be a cloud based service. Songs that you purchase on Recochoku can be redownloaded to other portable devices, such as smartphones.